Emma Shappley has been a part of First Baptist Church her entire life; 21 years to be exact. She grew up in the children’s ministry and the student ministry and just four short years ago she graduated from high school and became a part of our FBJ Home Students group (students who are away at college) that is such a vital part of our church’s future. Her parents, Scott and Paige, are critical figures in our student ministry and there aren’t many high school students who don’t form deep and lasting relationships with the entire Shappley family. “Scott and Paige are some of the most servant-hearted and self-sacrificing volunteers our church has ever known. They have given their lives to the discipleship of students and the result of their faithfulness to Christ is seen by the way that Emma has grown into a godly young woman who is committed to serving God with her life,” says Steven Smith, First Baptist Jackson’s College Pastor. When Emma graduated from Northwest Rankin four years ago, she went down a path that neither she nor her parents expected. She moved to North Carolina to attend Gardner-Webb University to pursue a dual degree in missions and public relations. “The choice seemed random at first because she was receiving invitations from different colleges, but when we decided to visit there to see what Gardner-Webb was all about we had a real peace about going there. It is about the size of Mississippi College and it just felt right,“ said Scott, Emma’s father. Although it seemed random, it certainly was not. God had plans for Emma. “At the Christmas break of her freshman year, Emma was sitting on her bed and told me she had a heart for athletes who have come from all over the country to Gardner-Webb. They don’t know anybody and they stay to themselves. Emma really felt called to do something to bring those athletes into the student body,” say Scott. “She felt like she was called to bridge the gap.” In just a few short weeks after that, Emma took action when she made a profound move in the university cafeteria. As we all remember, college cafeterias have certain turf rules; groups sit together and there is rarely a shake-up in seating arrangements. Emma decided to sit at the volleyball team table, which was a shake-up. “Her friends really didn’t respond well to that at first,” says Scott, “but that one move launched the incredible ministry that she has today,” he continues. Emma began a ministry of building relationships with athletes, college kids who are away from their families and who are under tremendous pressure to perform. She started by emailing the women’s basketball coach and asking if she could wash the feet of the players and share the gospel with them. He agreed but told her he couldn’t require his players to attend. Every player showed up and this was the beginning of a ministry that would only multiply to include many more of Emma’s friends. The men’s basketball team and the baseball team soon followed suit and since her ministry has launched, she’s been asked more than once to return and share the gospel again through her feet-washing ministry. 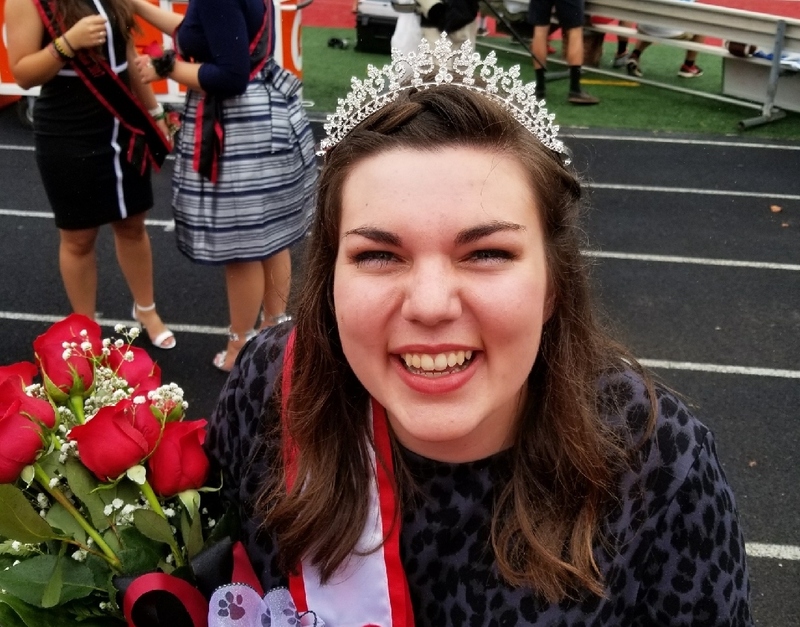 Last weekend, Emma was crowned Homecoming Queen at Gardner-Webb University, which is a very high honor. Today, she serves as the Coordinator of Campus Ministries and her decision to pursue missions as a career has been affirmed. “I love people, I love building relationships, and I love Jesus, and I want all of those things to come together when I finish college,” says Emma. “Emma is the picture of what a life fully surrendered to Jesus looks like. Her commitment to love others on her college campus is pointing students towards Christ in a powerful way,” says Steven Smith. To learn more about the student ministry at First Baptist Jackson, visit the student website. Emma is an inspiration to all of us! I can honestly say it was a privilege being Emma’s Student Pastor. You could not help love Emma because she had such a huge heart. I remember several conversations we had and it always had something to do with her desire to do more. As a high school student, she was not satisfied with just being a student but really cared for her classmates and wanted to be a difference maker. She always had a special place in her heart for the lonely and those that were hurting. But the bottom line is she wanted to not only help them physically or socially but she really wanted to tell them about Jesus. So it does not surprise me at all she is still doing what she has always done but just on a much bigger stage. Lord Jesus thank you for Emma and her love for those who are hurting! Let me say in closing though where Emma got her huge heart and love for people. Yes it was reinforced at the church and in the children’s and student ministry but it started at home. You will not find any parents that have bigger hearts and love for all people like Mama Paige and Scott Shapley. Parents this is a great lesson for us all it begins in the home. I think the greatest thing I can say about all the Shapley’s is this that they are just ordinary people that love Jesus and don’t care who gets the credit. They are not upfront leaders who want to be seen but they are folks that are always behind the scenes doing what God called all of us to do and this LOVE GOD & LOVE PEOPLE!!! I absolutely LOVE this. This is the true Christian life. Being a Jesus follower and treating others as He would!!!! Congratulations Emma! You are such a wonderful example for our girls today. MB came and talked with my 9-10 th grade Sunday school class before heading to 360. She talked about her mentor……you! That’s something that every believer needs…….a solid, proof in the pudding mentor.